Kathy Fagan speaks to a group of seniors at Sunset Meadows I on Monday afternoon, highlighting the latest progress on the Senior Social Center. Craig — Spirits were high after discussion of the proposed Senior Social Center at the Moffat County Active Seniors meeting Monday afternoon. 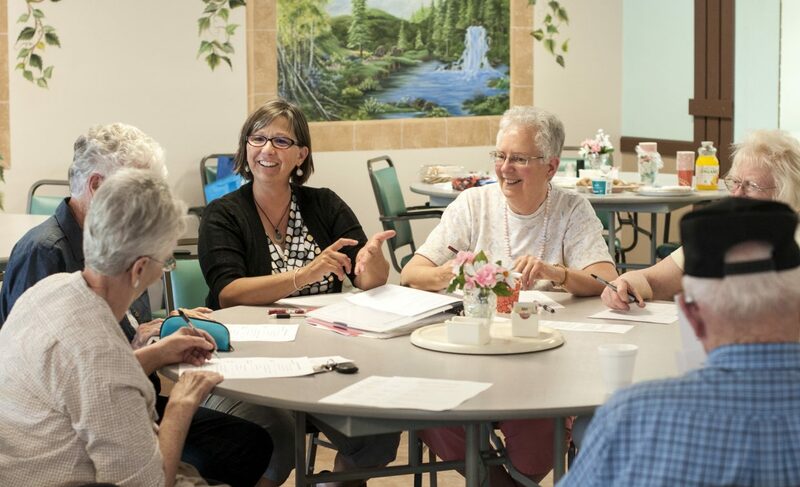 Circled around a table in the Sunset Meadows I dining hall, eight members of the group met with Kathy Fagan, chair of the interim board for the Senior Social Center, for an update on its progress. The idea began a year ago with the Area Agency on Aging, which passed it off to a citizens’ group to carry the project forward. In recent months, the group has established a bank account, an address, an EIN number, an interim board and a name: the Senior Social Center. And in less than a week, it will find out whether it’s won its first grant, $20,000 from the Agency on Aging. This would be the first major funding the Senior Social Center has received. Its past two fundraisers raised $207 from the Mother’s Day name contest and $47 from Whittle the Wood. The idea for the center came from a need for there to be one place where seniors can gather for group activities such as card or board games, take classes ranging in topics from art to fly-fishing to Facebook, as well as exercise. A site committee is working hard to find and assess possible locations for the center, foremost of which is the American Legion building. A feasibility study for this location is due Aug. 1. “The committee is really evaluating the options, their pros and cons and financial feasibility,” Fagan said. And that investment is on the cusp of reaping some great returns. The Senior Center Action Group held a meeting at 6:30 p.m. at Colorado Northwestern Community College on Monday.